For at about 20 pieces. Dissolve the yeast in the tepid water. Put the flour in a big bowl and make a small hole in the middle of it. Mix the dissolved yeast with the flour and finally add a pinch of salt and the milk.Whisk the eggs and separate the egg yolk from the egg white. Add the egg yolks to the dough (batter). Beat the egg whites until they’re stiff and mix them with the butter through the dough (batter). Let it rise during 30 minutes. 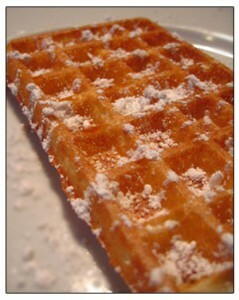 Heat the waffle iron fully, grease it with melted butter or a bit of oil. Put some dough on it with a spoon and bake the waffles golden brown. Powder the waffles with powdered sugar and of course you can add some whipped cream, ice cream and if you like strawberries (when the season is on). Hint: if you’ve got some waffles left, put them into the freezer and heat them later under the grill.